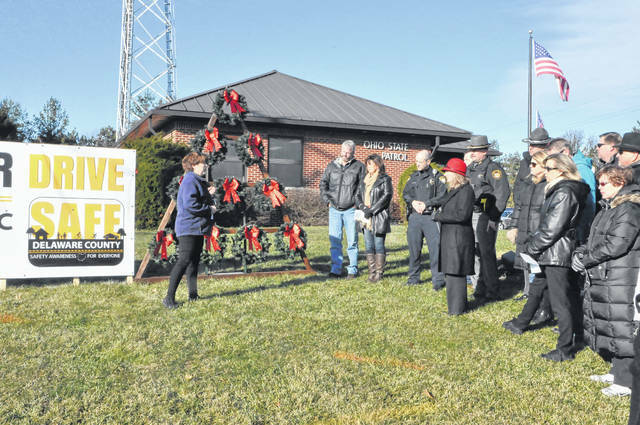 SAFE Delaware Coordinator Jackie Bain speaks to a group of community members, law enforcement and families of crash victims Wednesday morning in front of the Delaware Post of the Ohio Highway Patrol before the group pinned names of the deceased to each of the wreaths. A wreath memorializes James Hindes, a 19-year-old Olentangy High School student who was killed in a May 2016 crash. Hindes was one of 20 young people who were memorialized by wreaths at the event. 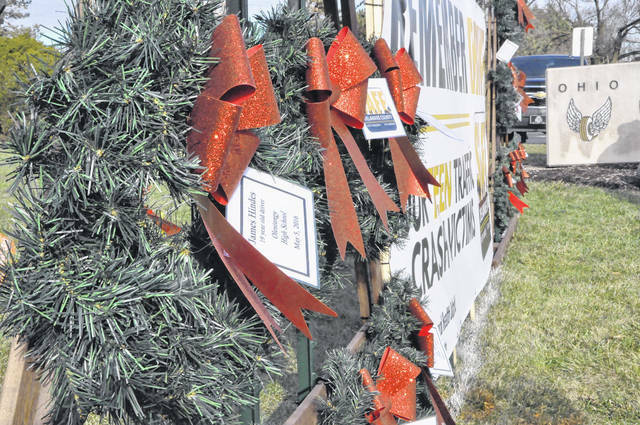 Motorists on U.S. 23 might notice a new decoration on the side of the road — 20 wreaths to memorialize young people killed in traffic crashes over the last ten years. The memorial is in front of the Delaware Post of the Ohio State Highway Patrol and an event to place the wreaths was hosted Wednesday by SAFE Delaware County Coalition. Members of the community joined with law enforcement and family members of crash victims to pin the names of people younger than 20 years old who were victims of fatal crashes to each the wreaths. Jackie Bain, SAFE (Safety Awareness For Everyone) Delaware coordinator, said authorities have reported an increase in teen traffic deaths and said SAFE Delaware would be forming a SAFE Teen Drivers committee to take action. Bain said the committee would speak to teens about safe driving and would include survivors of crashes. Bain said everyone gets stressed while driving, especially in a growing county like Delaware that is seeing more traffic and construction. Bain said everyone, not just teens, needs to focus on the road, avoid distracted driving, and drive with integrity. OSHP Sgt. Ty Skaggs echoed Bain’s comments and said everyone needs to be more alert and attentive. Bain said she spoke with Delaware County Juvenile Court Judge David Hejmanowski who said that in 2016 there were 839 traffic hearings in juvenile court and reported that there have already been 844 in 2017. Laryssa Hook, an extension educator with 4-H, said it’s crucial that parents talk to their new drivers about safety and good driving habits because parents have a lot of influence on their children. Bain said Delaware teens these days have a tougher driving situation because there’s so much traffic and stress and that when drivers see a “new driver” sticker on a car they should be more considerate. Contact Glenn Battishill 740-413-0903 or on Twitter @BattishillDG.